Seeking to dynamically alter the way that theologians, ecclesiologists, students of religion and ministers look at the relationship between church and society, this book takes religion, politics and society as basic categories and explores how oft-overlooked issues are in fact highly significant for the shaping of theological and ecclesiological horizons. The Ecclesial Canopy is not, however, simply about reading meanings into religion, politics and society. Rather, it sets out to faithfully interpret much of the material that surrounds us, yet is often taken for granted or unnoticed. Paying close and patient attention to beliefs, language, artefacts, rituals, practices and other material - all of which are constitutive for ecclesial life and theological identity - this book offers an invitation of engagement to the scholar or minister. The Ecclesial Canopy makes a significant and important contribution to the field of pastoral and practical theology. 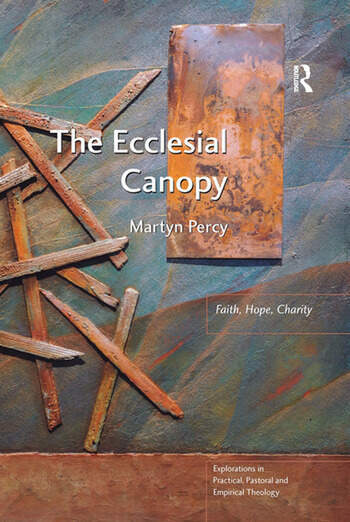 Building on the concepts of implicit and invisible religion, Martyn Percy offers a fresh and original interpretative 'take' on contemporary society, appealing to clergy, laity, scholars and all those working in the field of theory and reflective practice in practical and pastoral theology. Martyn Percy was Principal of Ripon College, Cuddesdon, from 20104-14. He is a Professor of Theological Education at King’s College London and Professorial Research Fellow at Heythrop College, University of London. He writes on Christianity and contemporary culture, modern ecclesiology and practical theology. His recent books include Thirty-Nine Articles: An Anglican Landscape of Faith (Canterbury Press, 2013) and Anglicanism: Confidence, Commitment and Communion (Ashgate, 2013). He was recently described in the journal Theology as the British Theologian who is closest to being a ’missionary anthropologist’. In 2014, he was appointed Dean of Christ Church, Oxford. .